Konrad Wachsmann's most famous project is the space frame hangar system he designed for the United States Air Force in the 1950s. 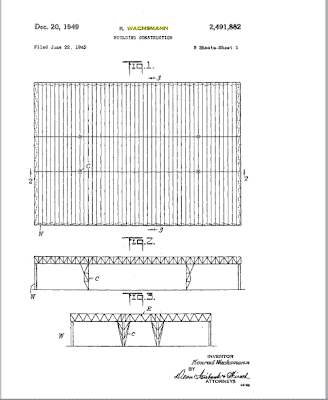 The literature devoted to this topic is exhaustive, and the space frame is often used as an example of Wachsmann's postwar experiments with joint-based modular construction. Nothing, however, seems to mention what the hangar was going to be used for -- housing what was then the world's largest airplane: the Convair B-36 Peacemaker. There is little doubt that Wachsmann's infinite-space construction was viewed as an optimal solution to house these gigantic bombers. 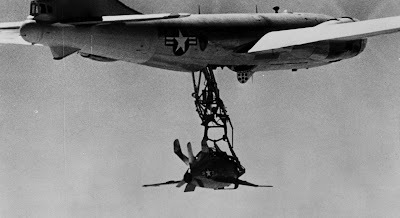 As this image below shows, even moving a brand-new B-36 out of its manufacturing facility was a dangerous procedure. Here, the aircraft has to be elevated and moved out sideways and nose-up so that tail section and immense wingspan could clear the factory floor. Even at the conceptual model stage, Wachsmann's space frame was intended to house large several B-36's under one roof. The image below, for example, shows three B-36's parked side by side. Since each aircraft had a wingspan of 230 feet, the flow structure would have to be at least 690 feet wide and 162 feet tall. 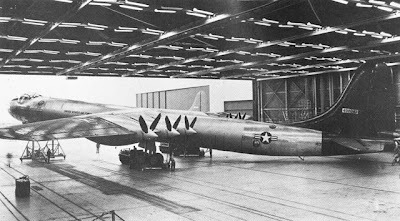 And to get a sense of the B-36's immense size, of the massive hangar needed to house such an aircraft, consider this image: part of a B-36's fuselage is being stood on its end for structural static testing. One need only look at the small figures on the hangar floor to appreciate the B-36's size. 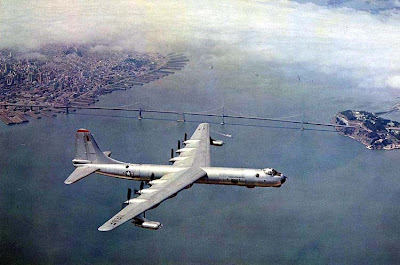 Yet the B-36 was a megastructure of sorts. 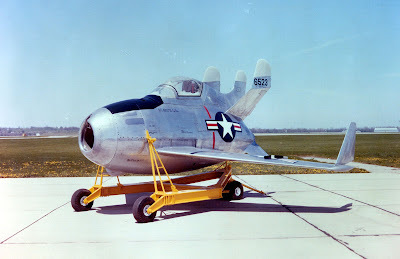 In addition to its being capable of delivering nuclear ordinance around the world, it was also designed to carry small aircraft inside its bombbay. 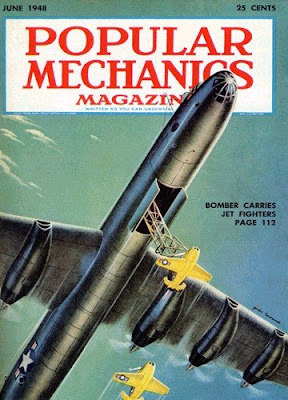 This fanciful image from a 1948 issue of Popular Mechanics depicts a B-36 in flight, releasing small yellowish aircraft from its belly. 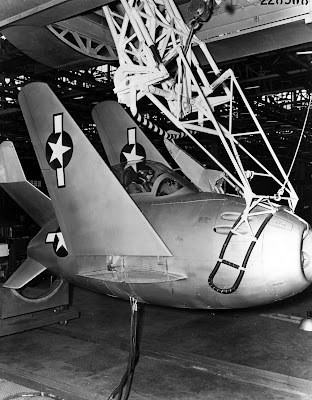 Yet this small yellow jet was an actual aircraft: the McDonnell XF-85 Goblin, the world's smallest aircraft. There is a comfortable irony at work here -- the world's largest aircraft could be modified to house the world's smallest aircraft. 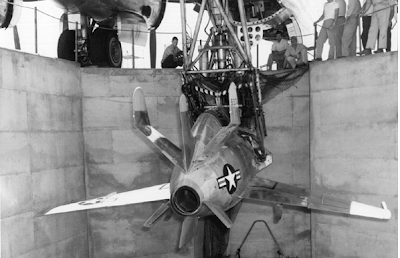 These images thus show how the XF-85 could be retracted into the B-36's bombbay: via a piece of equipment looking like a trapeze artist's bar. Reyner Banham, that most outspoken enthusiasm of architecture's own interminglings with technology, offers a sober assessment of Wachsmann's space frame. In "1960 - Stocktaking" (from a 1960 issue of The Architecture Review), Banham claims that the space-frame was "evidence of a fanatical watchmaker ingenuity on the solution of certain problems within the given context of built structure" yet fraught with banality as it lacked a "radicalism of approach." Wachsmann can be forgiven for this, especially when one considers how the B-36 program operates at every conceivable architectural scale. Wachsmann's hangar, with the potential to be infinitely expandable, exemplifies the largest scale possible. Inside this hangar, of course, are myriad aircraft of staggering size. And inside these aircraft are even smaller aircraft, no bigger than a small two-passenger sedan. When looking at the space frame as part of this system, perhaps Wachsmann's hangar seems more innovative than before. If not, at least more interesting. My Grandfather used to fly B-36s back in the Cold War. If I show him that first B-36 photo you've got above, he'll say '6 turning and 4 burning', it's a hybrid model with props and jet engines. I dig the Wachsmann connection, wasn't aware of that.